I hope everyone enjoyed the full moon and the Vernal Equinox over the weekend. My coven gathered together on Saturday night and celebrated the full Storm Moon, complete with a thunderstorm. We did not get to see the full moon because of the clouds. However, when I got up at 6:30 am the morning of the equinox, I checked my western facing kitchen windows to discover a huge looking yellow full moon setting in the western sky. So I still got to enjoy the moon. Last night the Hubs and I headed down to the Missouri river banks and watched the moon rise above the river. The moon was slightly lopsided, but still humungous looking and a orangey-yellow as it rose. It was impressive. This morning when I checked the gardens I discovered that one of my forsythia bushes is in full bloom! I love forsythia in the spring. Its so cheerful after the long winter. 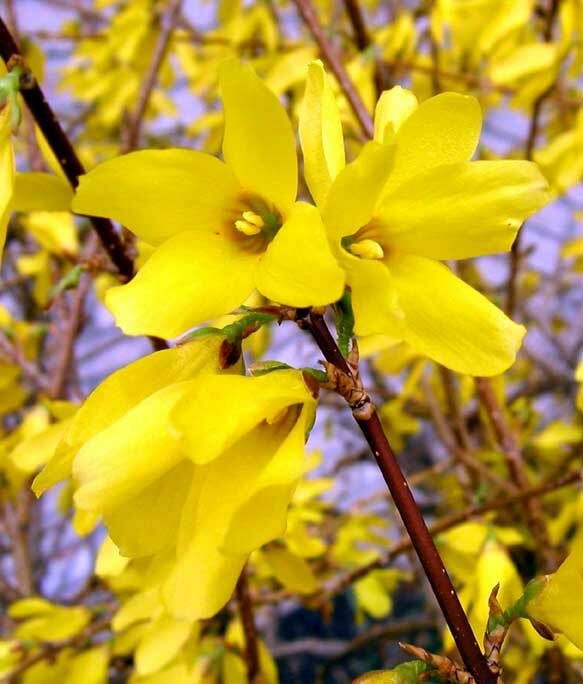 In the language of flowers forsythia signifies that the bearer is: "Good natured". Which makes sense to me, as its hard to be moping when you’ve got bright yellow blossoms staring you in the face. Yesterday in honor of the Vernal Equinox, I planted a few violas in my faerie garden birdbath. The birdbath has been turned into a little faerie garden…. The water dish was way too deep for the birds anyway so I mounded up the soil and planted perennial creeping plants in it, and every spring I add violas. There are some crystal clusters and a tiny faerie and a ceramic mushroom added to the garden to give it a faery tale look. Violas are so cheerful, and they smell terrific! Here is a picture of the Faerie/ Birdbath garden from last spring. Violas are a great little flower to plant at this time of year… and about the only thing I would consider planting this early in a Midwest spring. Violas can withstand some snow and like the chill- even though our temps were in the 70’s yesterday, and are supposed to be in the 60-50’s this week it can still swing back to the freezing point at night for a while. Violas are an enchanting flower, they are sacred to the Goddess Aphrodite/ Venus, and the God Eros/ Cupid and these little colorful flowers have many intriguing folk names… such as Johnny Jump ups, Kiss-me-at-the-garden-gate, and Heart’s ease. They are rumored to mend a broken heart- hence the folk name and in the language of flowers they whisper the message: I’m thinking of you. According to floral lore Cupid/ Eros accidentally hit the viola/ pansy with one of his arrows... and so ever after the flower smiled. 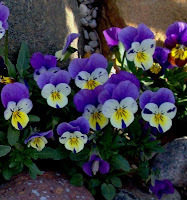 Take a good look at those happy "faces" on the violas and the pansy. Yup, they are still smiling. 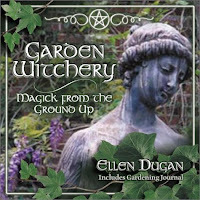 If you would like to learn more about the enchanting language of flowers or garden magick check out my books, Garden Witchery and Garden Witch’s Herbal. Both of these books were award winners, and you’ll love them. So go get outside and spend some time in the early spring garden. See what enchanting lessons you can discover. 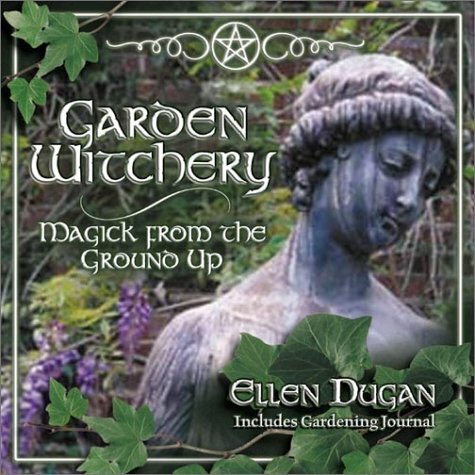 Conjure up your own witchery and celebrate the seasons as they change! Isn't it just so exciting when Spring finally arrives? The energy is literally growing all around us. 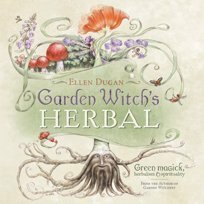 Your books "Garden Witchery" and "Garden Witch's Herbal" are must-haves for any Witch working in the garden this season! I just love your Faerie Garden! Looks like a great Spring project. I love pansies...they are one of my favorite flowers. All of your pics are beautiful. I love the flower idea in the bird bath. Our 3 yr old daughter decided that she wanted to put dirt and plant some wild flower seeds (the butterfly attractors) in ours this yr. Normally we don't plant anything in it. But she was very avid about planting flowers in it this yr so we let her pick them out. Then she said all the fairies and butterflies will be very happy when they grow big and strong. 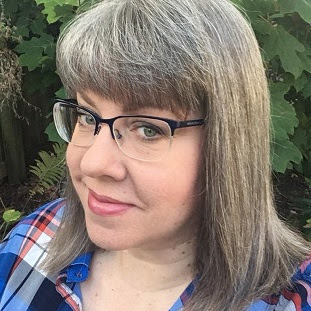 Great Post Ellen ! I do have a question...which of the 2 books tell more about the language of flowers & herbs ? Topaz- The Language of flowers (Lists of them) is featured prominently in Garden Witchery, However BOTH books are filled with that information and garden and herb magick. Garden Witch's Herbal is a sequel to Garden Witchery! I am currently taking your Herbal Magick course and just love it. We still have snow here. The crocus's are up, but have not yet decided to bloom. I can't wait for spring to cast it's spell in my back yard.